“So…what is this?” asked the puzzled cashier. I increasingly believe that my oddball purchases are the reason I never get carded at liquor stores anymore. Anyway, if you’d like a primer, aquavit — see also akvavit and akevitt — is produced in Denmark, Norway, Sweden, and certain portions of Germany which were at one point controlled by the Danes. It’s distilled from potatoes (Norway) or from grain (everywhere else) as a clear spirit, then flavored with carroway, dill, and other herbs and spices, so in many respects it’s like a Scandinavian gin. Norway likes to age their aquavits and drink them at room temp, whereas the other Baltic states prefer less age and more chill. Wikipedia covers the spirit fairly well, but Jason Wilson’s love of this Scandinavian spirit — professed in his book Boozehound — won me over. The brands you’ll see most often in this country are Aalborg (Denmark), Krogstad (Oregon!? Crazy Americans), and Linie (Norway), each one representative of its country of origin. I have a bottle of Linie, and I must say it’s very enjoyable. All that being said, it’s tricky stuff to mix with — as are eau de vie and genever — but more and more aquavit cocktails are cropping up these days. One I found particularly enjoyable comes from renowned Oregon bartender Jeffrey Morgenthaler (who, being from Oregon, was using Krogstad). Stir with ice and strain into a chilled cocktail glass. Garnish. Something about this drink, the herbs and the fruit and the barrel aging, just seems to fit perfectly with Danish Modern furniture. I’m serious, try it. And no, I don’t mean it tastes like furniture polish. I used Linie Aquavit, which is aged and heavy on the carroway, so the spirit tastes quite a bit like liquid rye bread (Krogstad, from what I’ve read, is heavier on the anise). I don’t own blended applejack, so in went the bonded Laird’s, which is quite a bit heartier. 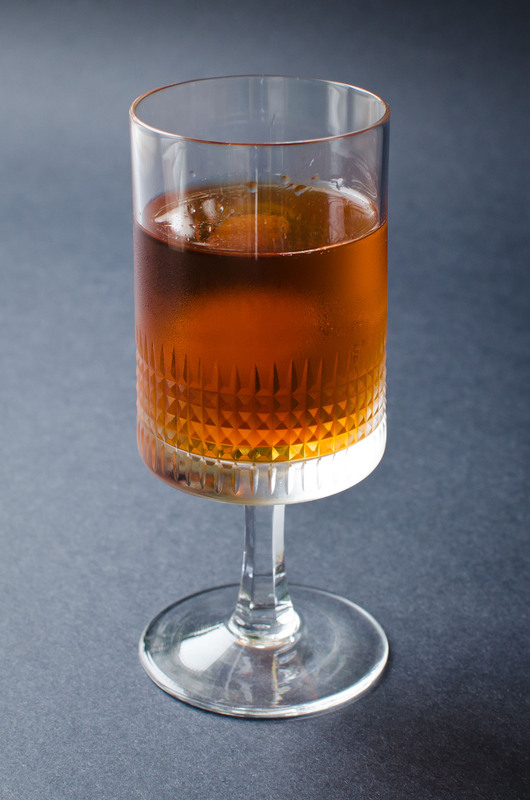 For the sweet vermouth, I have a bottle of Carpano Antica open, so in it went. Yellow Chartreuse is lighter and more floral or honeyed than its green relation, and was a perfect choice on Morgenthaler’s part. The result is a wonderfully herbal, boozy concoction, and not too sweet, unlike the Widow’s Kiss. 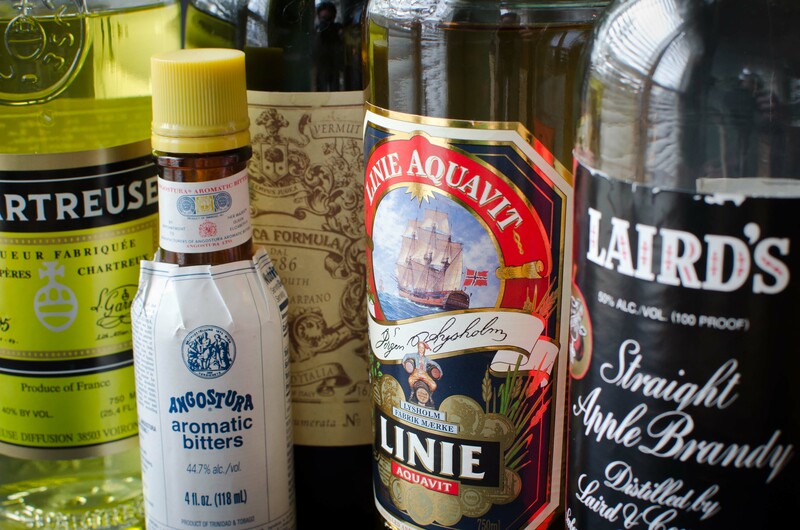 If you’d like to amp up the flavor of the aquavit, try using less apple brandy or switch to calvados, then use a milder vermouth (Martini, Cinzano, or Dolin). A few of Jeff’s reader’s have pointed out its structural similarity to the Vieux Carré, another excellent drink with two base spirits. Yes, Morgenthaler named it after the Beatles tune, which is a good one. Being an aquavit cocktail on a widely-read blog, quite a few people have discussed the drink since its inaugural sip, so be sure to check out the write-ups at SLOSHED! (with a few other aquavit-related links, including tasting notes), at Musings on Cocktails (Ereich prefers calvados as an ingredient), and at Summit Sips. Or, just Google “Norwegian Wood cocktail” and peruse any number of blogs for a few more tasting notes and rave reviews. If you need two other Aquavit cocktails to try, try the Horatio or the Trident (which is not for the faint of heart — it’s a funky one). Marvel Bar in MPLS use Aquavit in the Thomas Collins, which as you might guess is a variation on a Tom Collins but with pickle brine. Have wondered about aquavit. Love the drink’s name, Nowegian Wood. Sounds very intetesting. This entry was posted on January 9, 2012 by IJ Lauer in Angostura, Apple Brandy, Aquavit, Drink Recipe, Spirit Information, Sweet Vermouth, Yellow Chartreuse and tagged angostura bitters, apple brandy, applejack, aquavit, cocktail, drink, norwegian wood, recipe, sweet vermouth, yellow chartreuse.